Choose three of the following course modules to register for this course. You will access PayPal to complete your registration and payment process. Once registration is complete, look for an email from us confirming your registration and giving you the password to access the course modules. We strive to complete this process within 48-72 hours of receipt of payment. To begin your registration process, select four course modules and complete the registration and payment process through PayPal. After you have completed your transaction, we will contact you about choosing your fifth course module free of charge! Look for an email from this website within 48-72 hours of your PayPal receipt to complete your registration and to get information on how to access the modules. •Participants will complete a learning inventory to examine their personal learning style (CBMT Board Certification Domains: II.5.z; IV.A.1). •Participants will establish four (4) personal goals addressing creativity and development of therapeutic music experiences for clients (CBMT I.D.6; I.D.9; II.A.2; II.A.5). 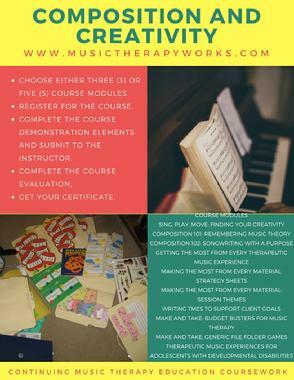 Participants will complete two brainstorming processes, indicated through the completion of the course worksheet, to identify multiple goals within therapeutic music experiences to support client goal domains (CBMT Board Certification Domains: I.B.3; I.D.6; I.D.10; II.A.2; III.B.1; IV.A.6). Participants will complete two therapeutic music experiences including music composition to support specific client goal domains (CBMT Board Certification Domains: I.B.3; I.D.6; I.D.10; II.A.2; III.B.1; IV.A.6). Songbooks, music sources, poetry books, etc. Access to resources – song books, clip art, visual aids, etc. Additional materials will vary based on which project you choose to create!! These include index cards, double-stick tape or glue sticks, Velcro, box cutters, envelopes, stickers, etc. Each project uses different materials (all easily obtained for little cost). Participants will complete a minimum of one (1) generic game board to engage client into music therapy interventions. Participants will develop game strategies for three (3) music therapy treatment domains using the generic game board created during the course.